She adds this note for Young Adult Readers: The pig and Montgomery’s revelations about her young self and the young characters will be of keen interest. DS. “The author (Search for the Golden Moon Bear, 2002, etc.) and her husband rescued a runt covered with black and white spots and named him after Christopher Hogwood, a noted conductor, musicologist and exponent of early music. They took the pig home to their New Hampshire farm, fully expecting him to stay modest of proportion. Fat chance. Succored by the author’s loving attention, Hogwood quickly put on 700 pounds and started to act like a pig, his musical affinities confined to a gamut of sonorous grunts. Montgomery reverently chronicles her charge’s behavior. He is diabolically smart, notorious for his neighborhood trespasses. He works his snout like a force of nature; practically dissolves when his belly is rubbed; and is worthy of performance-artist status as an eater. In his exuberant passage through life, he sets a standard by which Montgomery can measure her own comportment. In particular, he teaches someone keen on animals and leery of people how to be comfortable in the presence of human beings. ‘Animals had always been my refuge, my avatars, my spirit twins,’ the author writes. 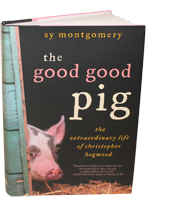 When someone asks what she is going to do with her pig, she is tempted to inquire, ‘What are you going to do with your grandson?’ While death haunts this book from start to finish, Montgomery learns a good deal from Hogwood about celebrating the evanescent pleasures of living.